Aktualna oferta pracy w Norwegii przy pakowaniu łososia na produkcji jako pakowacz lub pakowaczka – bez znajomości języka norweskiego, również dla pary. Konieczna znajomość języka angielskiego na poziomie minimum komunikatywnym. Osoby zainteresowane ogłoszeniem i spełniające kryteria prosimy o przesłanie zgłoszenia w języku angielskim do dnia 15.02.2013 włącznie. Skontaktujemy się z wybranymi osobami. Od administracji: W przypadku braku podanego adresu email lub telefonu prosimy kontaktować się z ogłoszeniodawcą za pomocą formularza kontaktowego (zakładka „kontakt” nad mapką po prawej stronie). We are interested in working in the same company. education Agricultural University Faculty of Biology and Animal Breeding direction of the Environmental Protection. Qualitifications : Knowledge an ability to organize and establishment. Knowledge of the Law Road Trafic. Experience: intership as a teacher and tutor. A shop children’s clothing/ Driving instructor. Experience in runing their own business. Record keeping maganement lectures – trafic regulations. Learning by doing – driving techniques vehicle, drive complies with regulations. Im interestand in this job and i’ll be right emloyee, steadfast and diligent. education: 2009-2012 School of Management in Warsaw majoring Administration. work experience: 2005-2006 worker supply, 2006-2008 Department of Mechanical and Production Packaging – specialist in recruitment and promotion, 2008-2011 – Żagiel S.A. – Sales Specialist, 2011-2012 – Sales Representative and Technical Advisor – Sales. I hereby give consent for my personal data included in my offer to be processed for the purposes of recruitment (in accordance with the Personal Data Protection Act dated 29.08.1997; Journal of Laws of the Republic of Poland 2002 No 101, item 926 with further amendments). Hi my name is Maciek an I’m 28 years old. Im from Poland and currently live in Oslo. I realy needs that job. Language: english good in writing and speech, currently I’m learning norwegian. I’m responsible and have good manual skills. I’m very interested that kind of job. Hi, my name is Patryk I’m 20 years old, was born in Auschwitz. I’m not afraid to take any work, conscientiously perform their duties. English language on communicative level. We are couple and from 3years we live in the UK. We have very good work experience on the warehouse and on the production line. Please contact us on email where we could send You back our CV’s. I resistant to stress and hard working. Witam wraz z moim chłopakiem jesteśmy zainteresowani tą pracą. 11.2010 – 02.2011 Fideltronik Imel – production worker. 06.2009 – 12.2009 Post office in Sucha Beskidza – assistant. I am interested this offer. Since 6 years I work as a chef in polish restaurant in Warsaw. Together with my family we want to live in Norway. 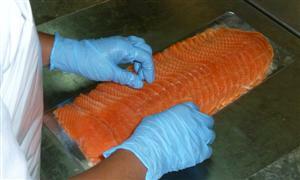 I am interested in offering a job in Norway fo rportioning and packing salmon. License B,BE,CE,T, forklift and communicative Engish. I’m ready to start the work at every time . I can go by car. I’m interested in your job offer. Advantages:We are ambitious and hard working pair of people. We learn very quickly. Able to work in a team. My name is Adrian Juszczyk and I am very interested in this offer. I was born in 1990. I’m freshly out of college, graduated Jan Kochanowski University in Kielce. I have experience in working on the production and fulfill all the requirements that have been placed on offer, including a category B driving license and knowledge of the English language at the B1 level and also at the level of the Russian A2. I would like to emphasize that I am very interested in this offer and has me great motivation to work. My name is Camille Stalski and also am interested in this offer. He graduated from the professional profile of a small catering chef. I have completed courses for forklift trucks (all types) category B driving license, knowledge of English at B1. My advantages are communicative and easy assimilation of new rzeczy.Pracowałem year in production. We are both interested in working for the same company. - Responsible for maintaining contacts with clients. - Managed a small team of co-workers. work experience: worked with the portioning of fish, worked on machines, including a category B driving licency, languages english communicative. my name is Lukasz Skiba. I am very interested in your job offer. My name is Sylwia. I am 25 years old. I am residing in Poland now. I am intrested in job in Norway. I am sure that I am an ideal candidate for this job because I am hard working person and I am not afraid any hard work.